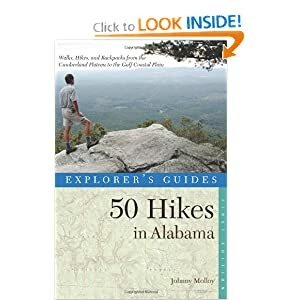 This book details 50 hikes that take place in the Alabama, from the Appalachian Mountains and Cumberland Plateau of the north to ridges and lakes in the heart of Alabama to the Gulf Coastal Plain in Lower Alabama. Specific emphasis was placed on the most scenic destinations and unique places that make Alabama so special, places like the Wall of Jericho with its rock formations, or the dunes of Bon Secour. Many hikes in this book take place on the Pinhoti Trail, the master paths of Alabama’s mountains. Other hikes take place within federal and state lands scattered throughout the state. Hikes of varied lengths and difficulties are included. Included are some of the classics such as the Big Tree, Peavine Falls and Chewacla Falls. However, the majority of hikes are off the beaten path, offering more solitude to lesser known, yet equally scenic, sights, such as Needles Eye and Blue Spring. This will give you the opportunity to get back to nature on your own terms.